I was naked and you clothed Me: He’s helping to distribute new clothes, provided by Heaven’s Family, to 325 men and women who live in a leper colony in India. On the outskirts of Koratty, India, there’s a dirt road that leads to a place of forgotten people. There aren’t many visitors to this 56-acre compound, and as we step out of our car it doesn’t take long before we’re spotted. Shadows inside concrete buildings begin to shuffle out to greet us. Some are hobbling, others are using crutches, and many keep their arms crossed and their hands tucked under their arms. They’re lepers. They’re hiding gnarled limbs that are missing fingers and toes. Although leprosy has for the most part been eradicated from the developed world, it still exists among the very poor, and India has more cases of leprosy than any other nation. Contrary to what is often thought, modern leprosy (Hansen’s disease) is not the same as the leprosy mentioned in the Old Testament. Modern leprosy is easily cured with medication, but unfortunately many victims don’t know about, or don’t have access to the drugs that can stop its progress. Consequently, many lepers aren’t treated until they’ve already suffered significant physical damage. Leprosy attacks nerve endings and destroys the body’s ability to feel pain and injury. So lepers unwittingly injure themselves with burns and cuts, and suffer infections that result in tissue loss. Fingers and toes become shortened and deformed as cartilage is absorbed by the body. One of poverty’s curses: Had his leprosy been treated earlier, he would still have all his fingers. Leprosy is not nearly as contagious as most people think. In fact, it is estimated that the immune systems of 95% of the world’s people would capably resist an infection. And when a leper receives the first or second dose of specialized antibiotics, 99% of the bacteria that causes leprosy are killed and the patient is considered essentially noninfectious. In India, however, when someone is discovered to have leprosy, their own family members consider them cursed, and they are driven from their homes and disowned. Worse, no one will associate with a family that has a leprous member for fear of being contaminated. No one will marry a child of a leper. Even though a treated leper is no longer contagious, lepers are shunned for life. We’re at the Koratty Leper Colony to distribute lungis (a long cotton cloth that is worn around the waist) to all 325 residents. Our host is a hero. His name is Johnsen, and he ministers the gospel here all the time, not to mention the fact that he plants churches and runs an orphanage (supported in part by Orphan’s Tear). Johnsen (pictured below) is following in the footsteps of his father, who witnessed a restaurant owner pour boiling water on a leper who was begging in front of his establishment. Johnsen’s father ultimately persuaded the government to provide lepers, the very lowest on the Indian social ladder, some basic human services. Johnsen has led many of the lepers here at Koratty to the Lord, and they love him dearly, just as they loved his father. Johnsen’s ministry is regularly supported through the Lepers Fund of Heaven’s Family. Left photo: Pastor Johnsen and 65-year-old Perumal, a resident of Koratty Leper Colony and a baby Christian, just 3 years old! At right: 68-year-old Dhamodharan. As we enter the first concrete building, it takes a few moments for our eyes to adjust to the dim light. Frail bodies are lying on wooden beds. This is the Advance Ward, where lepers wait to die. Thankfully, because of pastor Johnsen, most of them know what awaits them. They are looking forward to receiving their new, whole bodies in heaven. We listen to many stories. One is that of 68-year-old Dhamodharan (pictured above). He contracted leprosy when he was young, but it wasn’t diagnosed until it had already progressed significantly. He was a newlywed by that time, and when his wife told her father, he demanded that she divorce him. She refused, and she and Dhamodharan had five children. Dhamodharan continued to work as a tailor to support his family. Neither his wife nor their children contracted leprosy. However, when their children were old enough to marry, Dhamodharan left his family so his children could find spouses. Had he stayed, there was no chance his children would ever have been married due to his disease. He is grateful for the fact that he has a place to stay, and most of all that he knows what the future holds since he has become a follower of Christ. As we continue our visit, we are presented with many needs. Some men lift the legs of their trousers to reveal their homemade prosthetic legs that are falling apart. Others point to their sandals that are coming apart at the seams. They tell us that the government will provide them with leather, but they need a heavy-duty sewing machine to make footwear for themselves. (They each receive 150 rupees a month from the Indian government, the equivalent of about $3.50.) Because of your contributions, Heaven’s Family has just provided a $600 heavy-duty sewing machine that will sew through leather. How wonderful and loving is my Jesus who takes care of me every day. I will praise him all through my life and will glorify him wherever I go. Even if my family and friends leave me, I will serve him, and he will take care of me. And I will rejoice with the angels! A common ritual around the world: Collecting daily drinking water that is unfit to drink. Of the six billion people on planet earth, one billion don’t have access to safe water. And it is estimated that eighty percent of diseases in the developing world result from bad water and inadequate sanitation. Waterborne illness kills 4,900 people every day, most of them children under the age of five. While some American preachers encourage us to believe God for more personal luxuries, many of God’s children around the world are drawing their drinking water from mud puddles. Chuck has discovered a proven technology called the “Biosand filter.” These filters are easily constructed from inexpensive materials that are available all over the world, such as cement, PVC pipe, sand and gravel. Good bacteria that forms in the filter purifies water as it drains through the sand. Biosand filters remove between 95 and 99.5 percent of microbial contaminants as well as 100% of worms and parasites. Each unit costs only $65 to construct and can purify 15 to 20 gallons of water per day. They work for years. Our pilot filter project is already underway in Kenya, and a few of our Kenyan associates are being trained in construction and operation of the filters. Biosand filters will be ready by the time Chuck is in East Africa in June, and a friend of Chuck’s will be teaching about water purification and sanitation in workshops during Chuck’s pastors’ conferences in Kenya and Rwanda. Thanks for helping to give Jesus a drink. Sheeba Nerayanan’s beatific smile in the above photo hides her painful past. Born into a Hindu family in India, Sheeba’s father was an alcoholic and her mother was chronically ill. Her younger sister was diabetic. The family was very poor even by Indian standards, and Sheeba’s father drank away most of his meager earnings. The family often went without food, and Sheeba rarely attended school because her mother needed her at home. Things grew so bad that Sheeba’s mother considered taking her life and the lives of her two daughters to escape the poverty, sickness, and her husband’s alcoholism. She prayed to many Hindu gods, but nothing improved. One day, eight years ago, a pastor invited Sheeba, her mother and sister to a church that met in his house. For the first time in their lives they heard about Jesus, God’s son who loves, heals and forgives sins. They joyfully received Him. But fearing what would happen if their relatives, with whom they lived, would do if they found out they had become Christians, they kept quiet at home. Yet everyone in their extended household, including Sheeba’s father, noticed that something had changed. Sheeba’s new joy and peace could not be hidden. And her mother’s health improved significantly. So Sheeba’s father decided to visit the house church. He listened to the gospel. Soon he too was born again—and delivered from alcoholism. But when it was confirmed that all four members of Sheeba’s family had become Christians, their Hindu relatives chased them out of the home they shared. The pastor who led them all to the Lord took Sheeba’s family into his small rented home where he was already caring for ten orphans. They’ve lived there for eight years now. The pastor eventually sent Sheeba to tailoring school. Until recently, she was working for a tailor, as she could not afford a $100 sewing machine of her own. Now, with a new treadle sewing machine provided by Heaven’s Family, Sheeba is able to better support her elderly parents and her younger sister who needs insulin daily. Her dream is to build a small house where they can all live together. 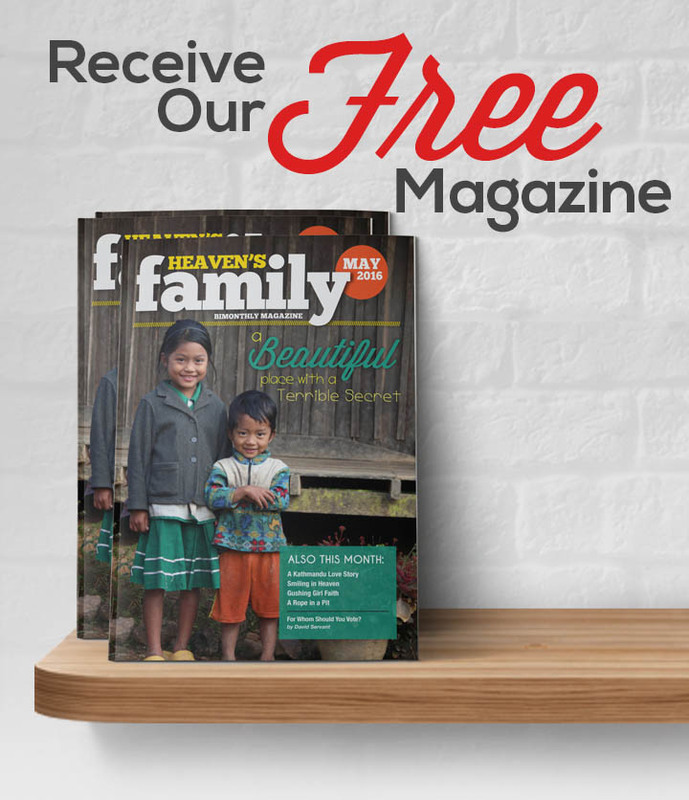 Last month Heaven’s Family provided a total of 15 treadle sewing machines for poor Christian women in India. Those machines will provide a means for them to make a living they would not have had otherwise. They’ll be thanking you in heaven. Bob and Lori Tucker: The truth saved them…and their marriage. I wish we could pass on every good report that comes to our office each month, but there are just too many for one newsletter. So we share some of what we receive. Below are the testimonies of Heaven’s Family partners Bob and Lori Tucker. Reading The Great Gospel Deception saved them…and their marriage. Bob: I had previously picked up other Christian books and tried to read them through. I can’t remember getting past the first couple of chapters before becoming bored with them. That was until I picked up The Great Gospel Deception. Not only did I read the whole book, I did so in about two days. I could not put it down! I am 100 percent positive that I would have gone to hell believing that the little “sinner’s prayer” that I once repeated was ALL I needed to do….The ear tickling, watered-down messages that I grew accustomed to over the years were sending me straight to hell, and I thought I was OK. The Great Gospel Deception took the blinders off my eyes….Other than the Bible, it is the greatest book I’ve ever read! Lori: Even though I was born again in September 1990, I had heard steady sermons and teachings of a very humanistic gospel as well as a humanistic Christianity which aided in blinding me to the scriptures….I didn’t hear about taking up the cross, denying self, dying daily or walking in holiness; just that God was just interested in blessing me and giving me “my best life now,” which led me to have no fear of the Lord and also led me to divorce Bob after fifteen years of marriage. How my eyes were opened as I read The Great Gospel Deception! I found myself grieved and repenting for my sin after each chapter. I even felt led to be re-baptized! This book revealed so much truth scripturally and gave me a healthy fear of the Lord. The Lord did amazing things in our lives as a result….God gave us a new found love for each other and a new relationship in Him. After five long years of being divorced, we were remarried on June 24 of last year, praise God!!! Now our family has been restored and the Lord gets all the glory! We’ve just reprinted The Great Gospel Deception in a slightly smaller paperback version. You can order your own copy of The Great Gospel Deception online. Panther and Nyathiec, both from the Dinka tribe of Sudan, now happily reunited in the U.S. If you haven’t yet rented the National Geographic movie God Grew Tired of Us, let me recommend that you do. It chronicles the journeys of three African boys among the twenty-seven thousand “Lost Boys” of Sudan. All of them were survivors of the Muslim Sudanese government’s massacre of hundreds of thousands of Christians who lived in southern Sudan in the late 1980s. The “Lost Boys” escaped with their lives—only because they were far from their homes watching cattle when their villages were attacked. They trekked barefoot (and some naked) over hundreds of miles of barren desert to seek refuge at the Kakuma Refugee Camp in northern Kenya. Half of them died during the journey—from bombing raids, starvation and wild animal attacks. Eventually, almost four-thousand of the Lost Boys were settled in the U.S., and my wife, Becky, became a “house mother” for five of them. She helped them for several years as they acclimated to life in the U.S. When they arrived, none of them even knew how to turn on a light switch. Two of the three young men whose journeys are chronicled in God Grew Tired of Us, Daniel and Panther, are personal friends of ours. Last year we raised funds to help bring Panther’s wife to the U.S., and she finally arrived last month. Panther and Nyanthiec had been apart for three years. We’re now helping Nyanthiec, who speaks very little English, to acclimate to American life. We’re also helping Panther build a school in his native village in Sudan. More than an incredible story of three boys who grew into men under the worst of circumstances, God Grew Tired of Us shines a spotlight on the realities of Western culture as Panther, Daniel and John learn to cope in a whole new world. While the stock market has been giving investors a very wild ride lately, investors in the Heaven’s Family Mutual Fund have been sleeping peacefully every night! The returns continue to be heavenly, and they are guaranteed by God! The HF Mutual Fund portfolio is diversified between all three divisions of Heaven’s Family, so that investors help orphans, widows and poor pastors every month. You can learn more about the Heaven’s Family Mutual Fund online. Nthale and Lydia Muindi, refugees who fled ethnic cleansing in Kenya, show off their new son, Timothy, born in Sikhendu Refugee Camp. Nthale and Lydia recently received Jesus with tears and now use their little tent for prayer and fellowship with other refugees. With a $50 grant from Heaven’s Family, Nthale has begun a profitable business selling vegetables, and will soon be able to afford a rented house. Gifts the Christian Refugee Fund made this possible.